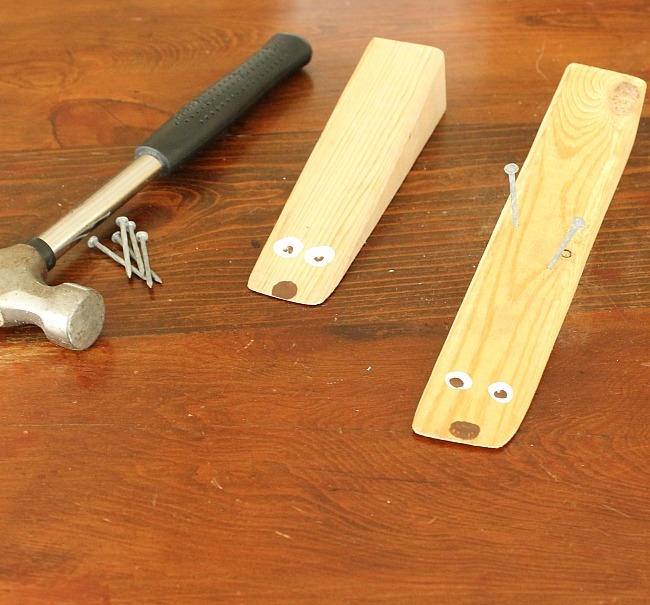 Crafts that involve wood, hammer, and nails are always (always) a hit around here. So I am always on the lookout for fun and creative woodworking crafts for my kids. I was browsing through Pinterest when I saw these cute woodworking hedgehogs by Vszell – simple and perfect for little hands. I popped over to the website and saw it was just a photo so I thought I would write a post about how we made these cuties. My boys thought they looked more like porcupines, and so we decided to go with that. We started this craft by taking a short piece of 2×4 and cutting it corner to corner to make two triangular shapes. Then, we sanded and sanded and sanded until they were nice and smooth. 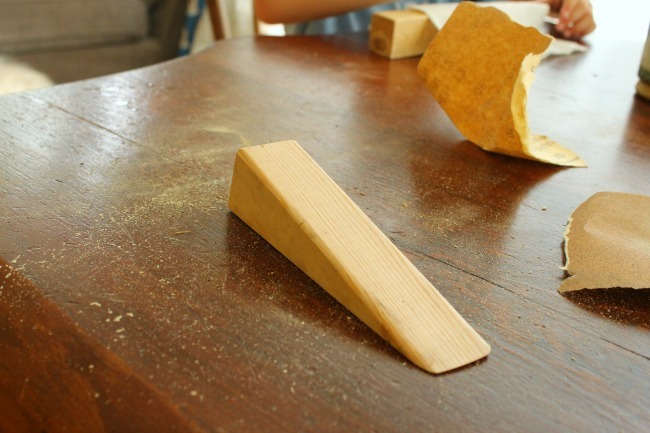 My boys like to rush through the sanding part, but I find it a very important part of a woodworking project with my kids. Some things in life simply take time in order to do them right. Ah, life lessons while sanding with Mama. After they were sanded smooth we painted on eyes and a nose. A permanent marker would also do the trick. Finally, we got to hammering! My intent was to head outside to do the hammering, but mother nature decided otherwise. As the rainstorm picked up steam we opted the kitchen table was as good as spot as any for this craft. Outdoors would really be the most ideal place to do this craft of course. If you have a very nice kitchen table, don’t do this craft on top! 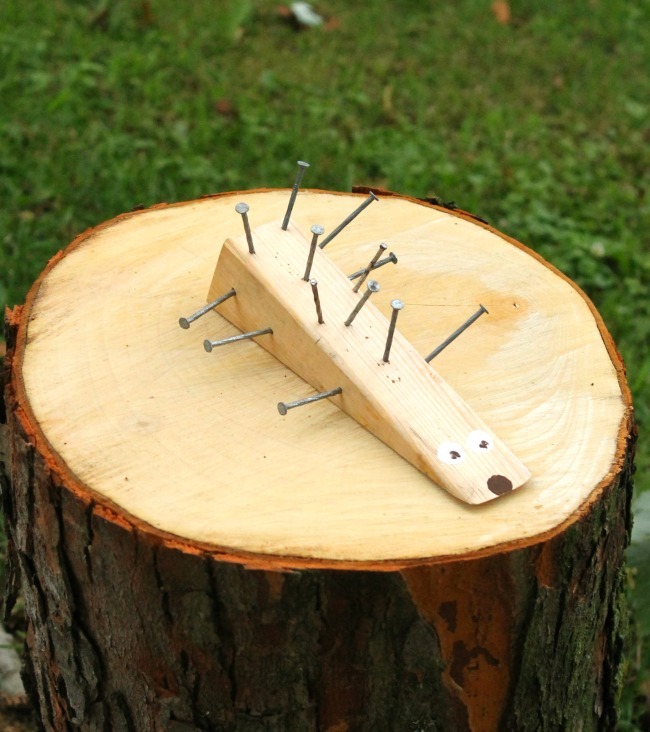 A piece of plywood would work very well and ensure no hammer or nail marks end up on the table. We are not that fussy around these parts. 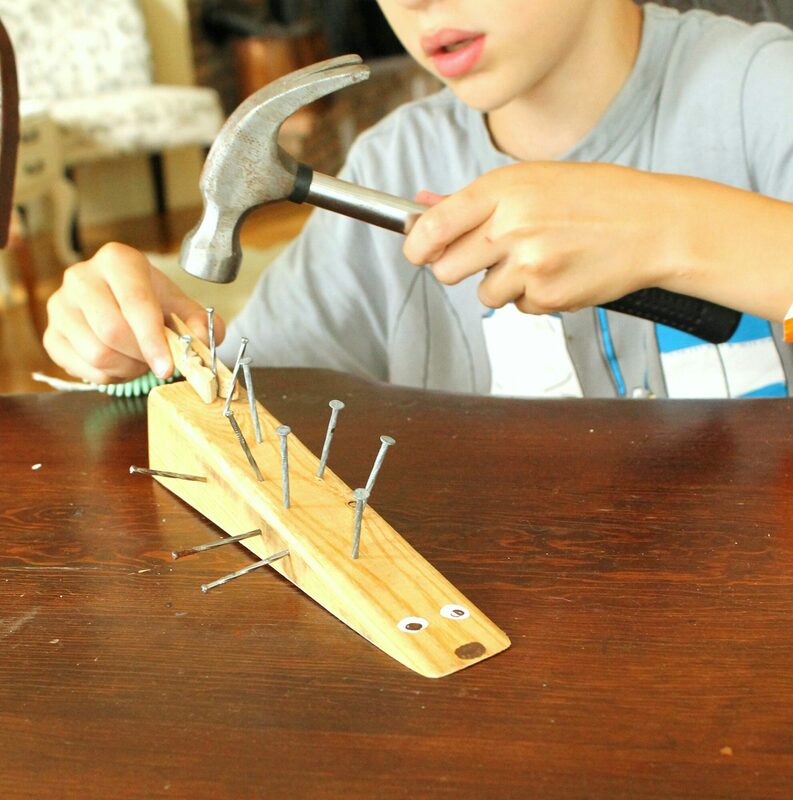 The boys like to use clothespins or pliers when hammering. This is a great trick for saving little fingers. The clothespin gives a bit more space between those little fingers and the nail head. 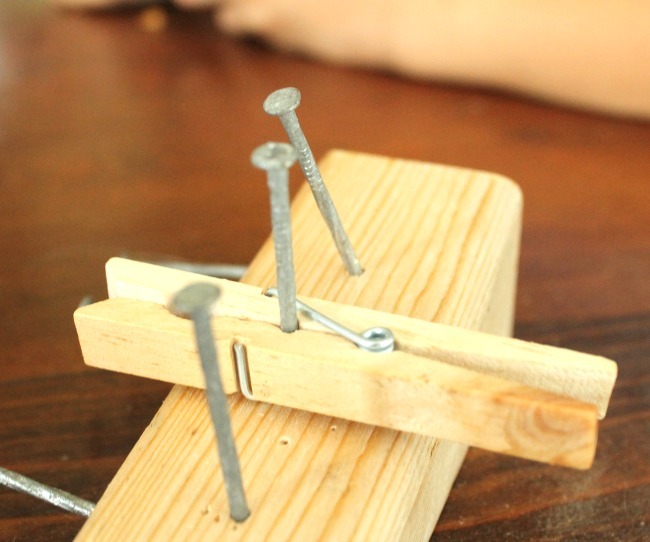 Most clothespins even have a tiny hole perfect for standing a nail. My boys found the nails with a bit of a larger head easier to hammer. I was hoping they would use the ones with the tiny heads to look more porcupine quill like, but practical outweighs cute when woodworking with my little ones. There you have it! Our latest woodworking craft for kids. I hope you like this craft and it sparks an idea or two for you perfect for your little ones. Thank you so much for reading friends, happy Monday! I will write to you again in just a few days. « 50 Amazingly Fun Crafts for Kids! 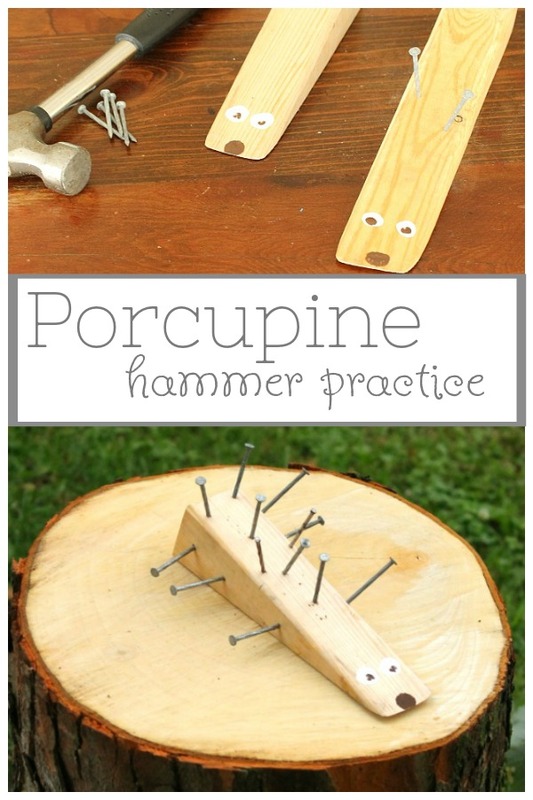 These look very cute and I have been wanting to do a little woodworking project with my class. Do you have any other ideas for 3-4 year old young builders? Thank you for sharing your ideas.